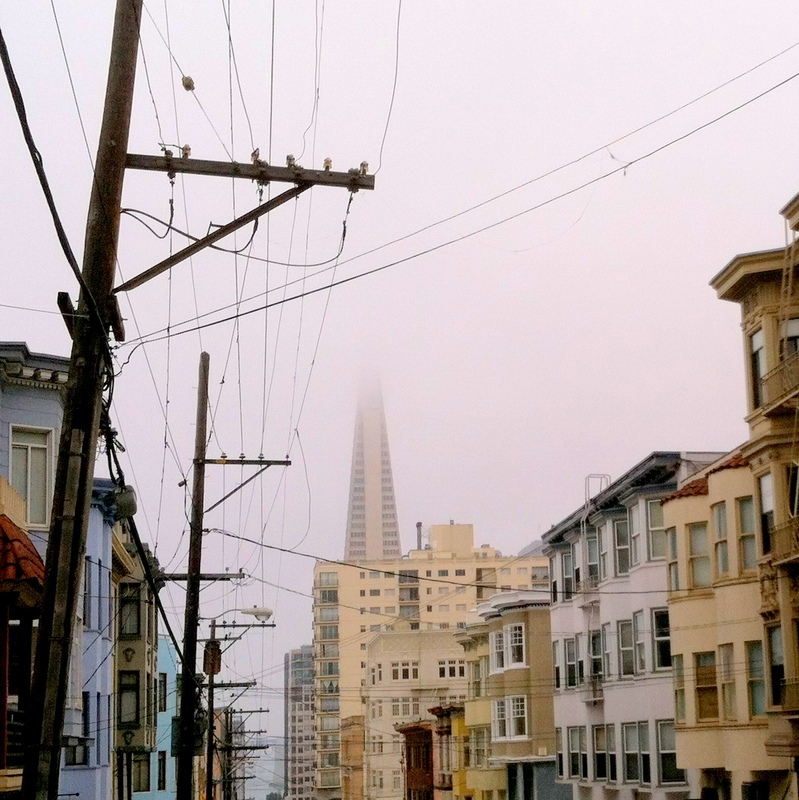 Transamerica Pyramid in the fog. There’s something about San Francisco. You sense it as soon as you get off the plane. Maybe it’s the weather – whatever that happens to be. Maybe it’s the constant horizon of old Victorians tumbling over hills like the backs of stegosauruses. Maybe it’s the yelps of sea lions, or, for a born-and-bred Easterner, the sense that you’re pretty far from home: the end of the road, beatniks, the sun setting over the ocean. Maybe it’s the Rice-A-Roni. So when a good friend who’d never hopped the Mississippi asked if I’d like to accompany her on her first journey west, to San Francisco, I blurted out yes before I had time to even think about it. “Have you heard of Tartine? We have to go to Tartine,” our host asked us – or told us – as we drove away from SFO. Tartine Bakery (600 Guerrero Street) is a corner storefront in the Mission District by Dolores Park. In 2007, Mark Bittman called it his “favorite bakery in the United States.” In 2008, its owners won the James Beard Award for best pastry chef. And on that particular sunny Friday afternoon in October – San Francisco’s excuse for a summer – the line snaked past a glass case filled with a dozen or two varieties of tart and cake and pastry. We opted for a lemon cream tart and a chocolate hazelnut tart and, this being in San Francisco, joined the communal table overlooking 18th Street. We shared a latte – served in a bowl – and muttered who-remembers-what between moans and heavenly mouthfuls of lemon and hazelnut and cream and coffee. 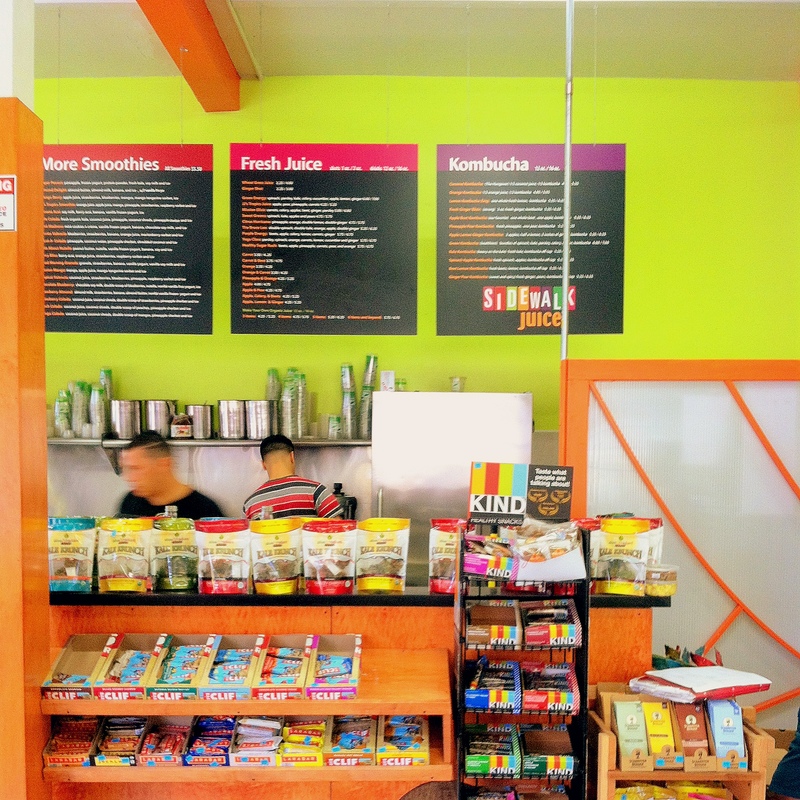 “You have to try kombucha.” So, walking down Mission Street past a vendor selling danger dogs, and turning onto 24th Street, we stopped in at Sidewalk Juice (3100 24th Street), where I ordered their favorite: one whole beet, one apple, and kombucha. Kombucha is a slightly bubbly fermentation of black tea and sugar. San Franciscans have apparently gone crazy for the stuff, opening kombucha stores left and right and brewing the stuff on their own at home. My beet, apple, kombucha blend tasted like a mixture of borscht and sparkling cider, which makes sense but also makes for a rather particular taste. San Francisco has long been a city of chocolatiers – from Ghiradelli at Fisherman’s Wharf to TCHO near the Ferry Building. Walking along Valencia Street at dusk, we were struck by the bouquet of sugar and cocoa nibs and ducked into Dandelion Chocolate (740 Valencia Street), a small factory in tones of wood and steel that offers free, short tours of its operations – compostable hairnets included. A visit wouldn’t be complete without a decadent “flight” of three brownie bites – each made from a Venezuelan, Papuan, or Malagasy varietal, each with their own radically distinct taste. 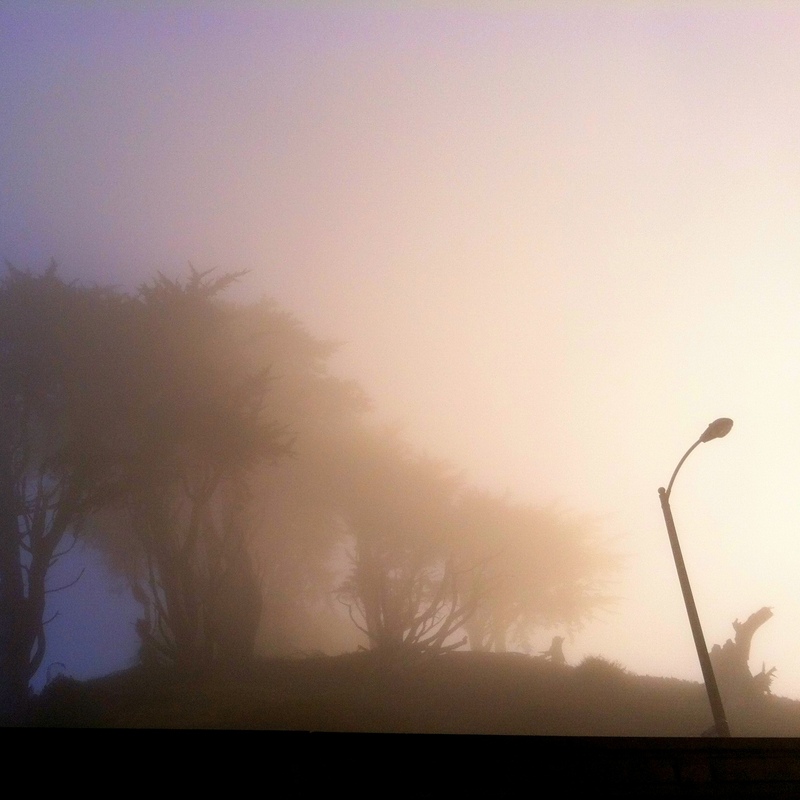 Morning fog at Grand View Park. Morning in the Sunset is fog. And after a steep Saturday morning trek to the top of Grand View Park in the mist, we stopped for first breakfast at Arizmendi Bakery (1331 9th Avenue). Arizmendi is exactly what you expect of San Francisco: a worker-owned up cooperative serving up simple, fresh, beautiful breads, pizzas, and pastries. A berry scone and a roasted tomato and corn focaccia were wonderful washed down with the house-made chai. Second breakfast (brunch) was several hours later at Venus Restaurant (2327 Shattuck Avenue) across the bay in Berkeley after a visit to the Rose Garden (where we inadvertently interrupted several family photos) and a walk around the university (to ogle the views from the Campanile). At Venus, we discovered Berkleyites are relative teetotalers, preferring coffee and tea with brunch over mimosas and Bloody Marys. Third breakfast was attempted at the upstairs café at the original slow food, farm-to-table eatery, Chez Panisse (1517 Shattuck Avenue). As expected, walk-ins were not especially welcome (the next available reservation was the following week), and all we left with was a photo of the daily menu. Next time. Back in the city, we spent the afternoon wandering the neighborhoods, from Alamo Square to Haight-Ashbury to the Panhandle and up to Japantown and down to the Castro. 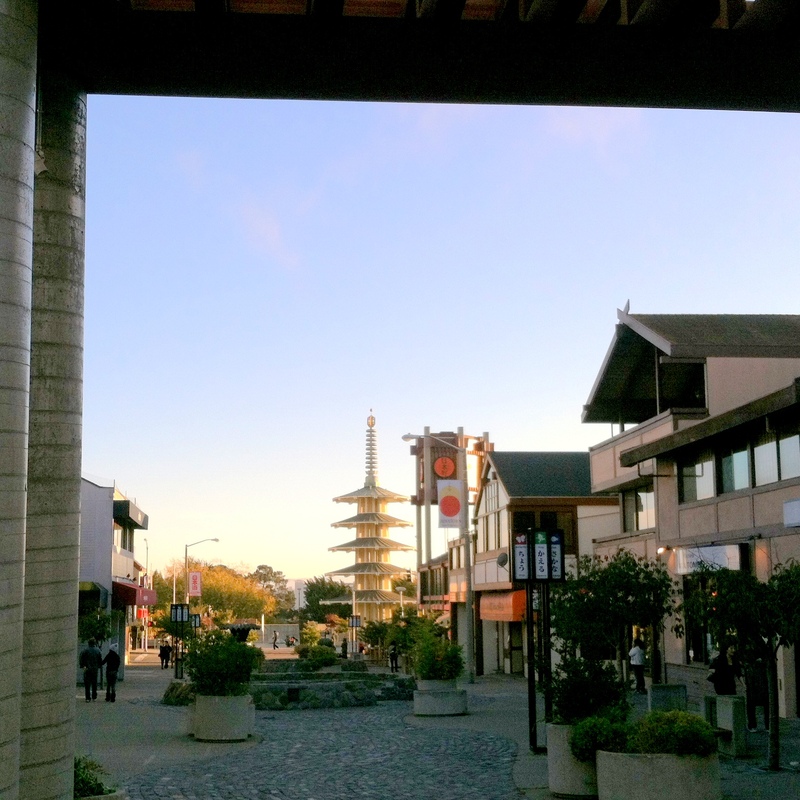 At the Japan Center, we stopped in Isobune (1737 Post Street), a tiny, dimly-lit restaurant notable not so much for its food as the boats of sushi floating in a circular canal past its customers. More expert Japanese fare was had at Izakaya Yuzuki (598 Guerrero Street) in the Mission which features a menu of about twenty small plates meant, among them a silken chawan-mushi with uni, a delicate salad of Dungeness crab and wakame, and miso-braised beef. Every once in a while, you come across a dish entirely outside your realm of experience. That was ika shiokara – squid cured and marinated with salt and its liver. We were warned that the dish was “very salty” and not to every customer’s liking, even in an adventurous food city like San Francisco. The dish is indeed salty, but with a deep, briny, irony flavor almost like varieties of caviar but with an entirely alien texture. Sunday morning was dim sum with friends. 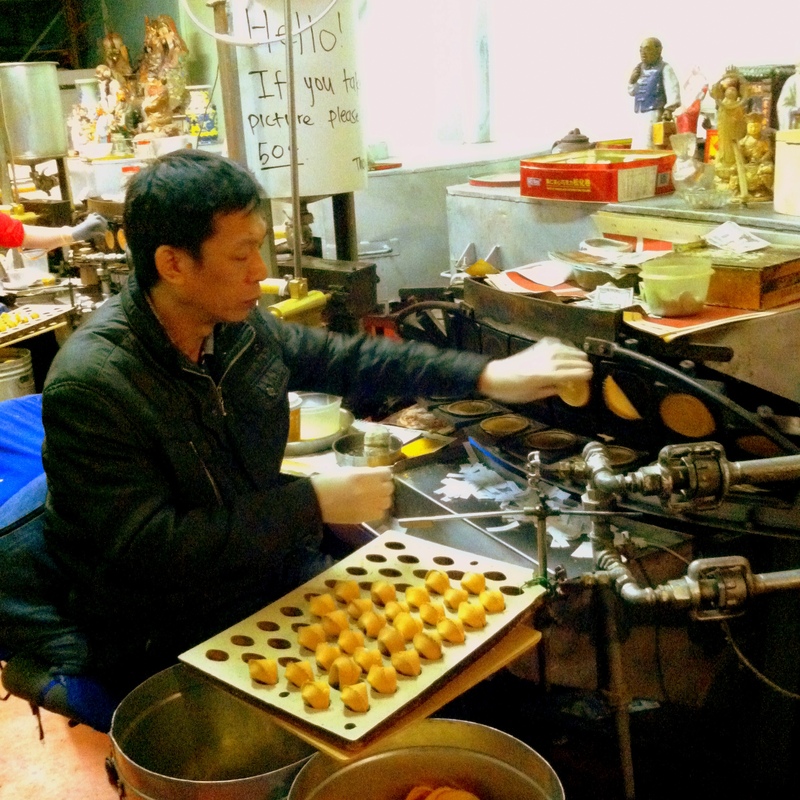 But with a few hours to kill before then, we wandered around Chinatown, visiting the sweatshop-like Golden Gate Fortune Cookie Company (50 Ross Alley) and stopping in for coffee and Chinese pastries – an egg tart and a coconut cream bun – at AA Bakery & Café (1068 Stockton Street). Brunch itself was at Yank Sing (101 Spear Street) in the atrium of an office building near the Embarcadero. We had an assortment of typical dim sum – har gow, shumai, turnip cake, and more egg tarts – but found the restaurant had run out of my favorite, char siu bao (barbecue pork-filled buns). Two groups of the brunch party independently headed to Blue Bottle Coffee (1 Ferry Building), an Oakland- and Brooklyn-based roaster, at the Ferry Building after brunch. Walking along the Embarcadero through Touristland, we tried chocolate at TCHO (Pier 17) and Ghirardelli (900 North Point Street) (pumpkin spice-flavored, it being fall 2013 and all), before heading up Russian Hill and Nob Hill to the Fairmont Hotel, where we imbibed at the basement Tonga Room (950 Mason Street). Golden Gate Fortune Cookie Company. The Tonga Room is a ticky-tacky tiki remnant of an earlier time, with thatched huts and garlands of lights surrounding a pool. Later in the evening, a band plays on a boat floating at the pool’s center. Drinks are, of course, sweet, tropical, and rum-based concoctions with umbrellas and maraschino cherries while the food is mainly mid-century “Polynesian” creations suspended in gloppy, brilliantly-colored reductions. Our final meal of the trip was at Source (11 Division Street), a vegan/vegetarian place tucked out of the way on a lonely block of the Design District. Much of the menu features “cluck,” “quack,” “moo,” and “oink” – non-meat substitutes for their respective animals. (The menu also offers “bow wows,” but I wasn’t nearly that adventurous.) I ordered a sort of pho or hot pot a visually beautiful dish featuring cluck. Cluck, I imagine, must taste like chicken to someone with only the faintest recollection of what chicken actually tastes like. Unfortunately, I had tasted chicken more recently. There’s something about San Francisco. It’s probably not the Rice-A-Roni, but the food certainly plays a significant part. The variety, the density, the freshness, and the creativeness are nearly unparalleled, and a bad meal is pretty hard to come by. As long as you avoid cluck and quack and the other meat replacements, that is. But even then: cluck it, you’re in San Francisco.